This plain-English guide tells you everything you need to know about small business bookkeeping, money management, tax returns and VAT. Part 1 covers bookkeeping and small business accounts – you’ll discover how to grow your business and save hundreds of pounds in accountancy fees by taking control of your income and expenses. Part 2 shows you how simple it is to complete a business tax return, using real-life illustrations – after reading this section you’ll have a solid understanding of how your business is taxed. Part 3 contains an indispensable guide to VAT – how to register, how to fill in your VAT return, and how to reduce the amount of tax you have to pay. The current edition also contains a 30-page section on how to improve cash flow in your business and boost your profits. The author reveals all the tricks you can use to keep the money rolling in, including billing tactics that ensure every invoice gets paid quickly... without upsetting your customers! Anyone wanting to make light work of managing the finances of a small business. Everyone with a new business or thinking about starting a business. Sole traders who want a clear jargon-free guide to completing their business tax return. Anyone wanting a comprehensive plain-English VAT guide. All businesses approaching the £85,000 VAT registration threshold or considering voluntary VAT registration. All businesses that want to improve their cashflow. Very clear guide to small business bookkeeping. Excellent chapters on how to save VAT and improve your cashflow. Layed out in logical, easy to follow chapters. Very useful for quick reference. Brilliant book and does what it says, keeps it simple. Having recently taken over all the accounts work I wanted a book I could cross reference from what I have been shown to do and be able to look up anything I'm not sure of and this book has managed to do it all. Nice sized text and diagrams, with small sized sections which doesn't make the book difficult to read and follow and easy to dip in and out of. Highly recommend. My favourite section has to be Section 8 because Cash is King and no matter how profitable a business is, it will fail if it does not have cash. That section alone is worth the price of the book. It is also up to date touching on issues like making tax digital and selecting and using cloud accounting software. How to keep track of all your business income, invoices and expenses using a few simple spreadsheets. How to generate invaluable information that will help you grow your business and make more money. How to complete your business tax return quickly and accurately – a box-by-box illustrated guide. A detailed list of all the expenses you can claim to cut your tax bill. Absolutely everything you need to know about VAT in plain English. Important changes to the VAT Flat Rate Scheme. How to complete your VAT return without fuss. How to choose a good accountant or bookkeeper… and avoid excessive fees. How to do basic accounting controls, bank reconciliations etc. How to send out invoices that get paid promptly and keep track of unpaid invoices. What records the taxman expects you to keep. How to keep tight control of your business stock. How to recover VAT on overseas purchases and when travelling abroad. How to handle your first employee – PAYE, contracts etc. James Smith BSc FCA is the author of several guides for small business owners and private individuals. He originally trained with KPMG, one of the largest accounting firms in the country, and now runs his own accounting practice based in Oxfordshire. 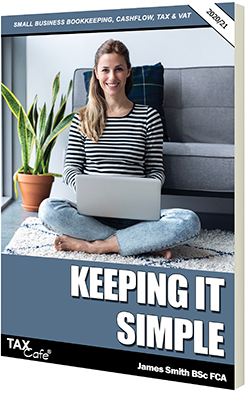 Keeping It Simple - 226 pages of tax saving ideas. Professionally printed by one of the UK's leading book printers. The Taxman Typically Pays 42% of the Cost! - If you are self-employed this is a legitimate expense and fully tax deductible.